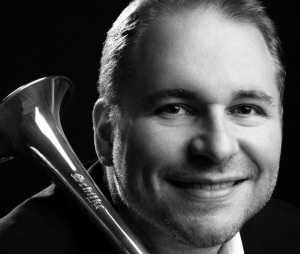 Marc Geujon is presently the Principal trumpet “Super-Soliste” of the Opera de Paris orchestra. As soloist, he regularly plays with orchestra, piano or organ. Professor in the Conservatoire de Saint Maur, he appears regularly in masterclasses in Europe and Asia.Before joigning the Opéra National de Paris, Marc Geujon has been «principal trumpet» in orchestras of Garde Républicaine, Mulhouse, Orchestre de Picardie and Orchestre de chambre de Paris. He appeared as guest principal in orchestras like Orchestre Philharmonique de Radio-France, Orchestre National de Lille, NDR Sinfonieorchester of Hambourg, DSO-Berlin, Jenaer Philharmonie, RTV Ljubljana, the Bolshoï orchestra. As soloist, he played with Opéra National de Paris, Garde Républicaine, Orchestre de Picardie, Orchestre de Rouen, Baltic Chamber Orchestra, Paul Kuentz Chamber Orchestra, Moscow Chamber orchestra, Saratov Symphony. He plays frequently with pianist Aya Medous and organist Pierre Cambourian. In 1997, Maurice André invited him to participate as soloist in concerts “Prestige of the Trumpet”. In 2013, he played the french Premiere of Matthias Pintscher’s «Chutes d’étoiles», with Reinhold Friedrich and Opéra National de Paris orchestra, under the composer’s baton. In 2014, Marc Geujon was invited for a recital during the International Trumpet Guild Conference in Valley Forge/USA. He is also a member of the Opéra de Paris brass quintet. Marc was involved directly with the design of the Schilke C3HD.